← January No Spend Challenge! Ive finally managed to get back into the craft room today, for the first time since before Christmas. And I do mean literally – my craft room floor has been piled high with all sorts since the week before Christmas when my parents visited, and I just shoved it all in to get it out of the way. I’ve not been able to set more than one foot in there for weeks. So today was the day. 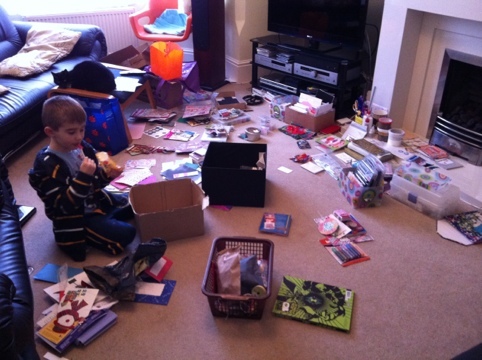 My husband went out for a bike ride and my son helped me transfer all the mess from the craft room to the lounge, to allow more space for sorting (he was bribed in this endeavour with sweets). About half way through I left the room, and when I returned it struck me – what a disaster zone! It was at this point that I started to frantically try and return things to their rightful homes before my husband got home and wanted to actually sit down! How I managed to fit all that stuff into a room the size of a postage stamp I’ll never know. Anyway, this evening I managed to actually *do* some craft. Three birthday cards in fact (only one of which has a recipient planned, the others are for ‘stock’). I’ll share just one with you tonight, the one for my father-in-law, whose birthday is at the end of the month. My mother-in-law gave me these awesome stamps for my birthday, and I think they’re going to get lots of use! 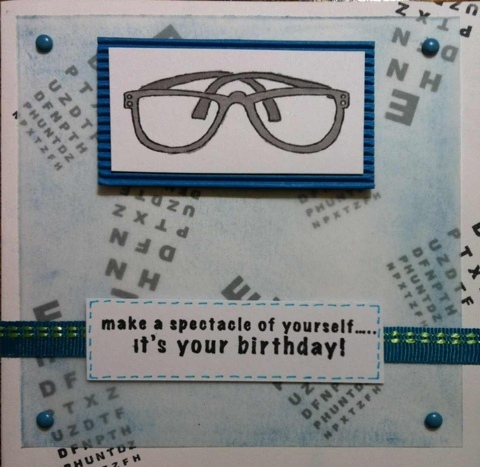 This entry was posted in Card making and tagged Brads, Card making, pens, ribbon, rubber stamping, vellum. Bookmark the permalink. Hope you got everything back in its place-eventually! I love that card-those stamps are brilliant,especially the sight chart.